The application process was so arduous I thought the airport interview might even be worse. I knew they’d take our fingerprints (all ten of them), and I knew they’d take our pictures, though I didn’t know we’d have to take our glasses off, producing two racoons. But I thought it might also be more qualitative – I thought they might be looking for some of those behavioral clues that you’re concealing something, those things the TSA people with gimlet eyes are trying to ferret out as they stare grimly at the poor souls in security lines. I thought we might have to take an oath of allegiance to the country, be quizzed about our pasts, be scanned for contraband. Nope. The only bad thing about it was that it was at six p.m. in the middle of the Memorial Day weekend, and I guess the Homeland Security guy was as unhappy to be there as we were. Pretty soon we’ll get our trusted traveler numbers and our cards, and we’ll be able to whisk through security, just like Marc Weber Tobias. 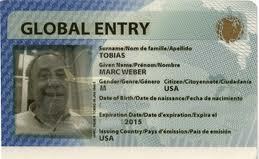 This entry was posted in Travel and tagged Global Entry, Homeland Security, trusted traveler, TSA Pre Cert. Bookmark the permalink.